When it comes to payroll Normans has got you covered. Our simple and comprehensive payroll service covers all your HMRC and Auto Enrolment obligations and gives you the reporting outputs you need as an employer. 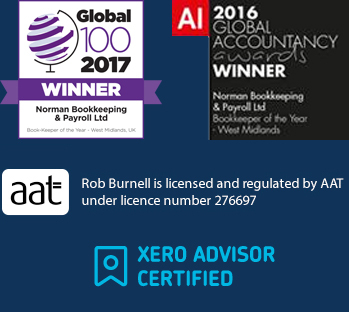 Our qualified and experienced payroll team are here to help, we also have an Independent Financial Advisor who will handle all your Automatic Enrolment Pension obligations – If you already have a scheme in place our IFA will administer it for you, giving you peace of mind that your scheme is in the hands of a Pension expert. Below is a detailed list of charges for our services with examples and a summary of what you get. Want to reduce your internal responsibilities & ensure your payroll runs efficiently, call us now to discuss your needs. Let’s start with the piece of information that you want to know first. This is a one-off fee to cover necessary administration and set up your company on our systems. We do not recharge the setup fee when alterations or new staff are added to your payroll. Calculating the cost of Normans payroll service for you. We offer payroll services dependent on your business needs or preferences. If you pay your staff weekly, bi weekly, 4 weekly or monthly our pricing systems ensures that your processing costs remain the same per staff member. The only time your costs could change is when you add new staff as our costs are based per person. The pension upload fee is set at £6 per upload. This is a set fee paid every payroll run but it covers all your staff whether you employ 2 or 200 people…..it just £6. At Normans we use an Independent Financial Advisor who is a pensions expert to administer our clients pension schemes. Many Payroll providers attempt to do this in-house. However, we feel it is imperative that we have someone with extensive knowledge and experience handling this essential process for our clients. If you are looking to reduce internal costs for distributing payslips to staff then we have the answer. For just £1 per staff member, we will upload your staff pay slips to a secure online portal. We then send emails directly to your staff’s personal email addresses notifying them that their payslips are ready to be viewed online. They all have direct access to this portal. This method is secure and ensures your staff have their payslips on time every payday, and that they can access historical pay slips at their own convenience whenever they need to, they can also download a free app and access their payslips on their mobile phone. It’s one less job for you to worry about which is especially handy when you are covering holiday and sick leave in a small business. Business A: employs 8 people and pays them weekly. We email payslips directly to staff and complete the pension upload every week in line with the payroll run. After the initial £10 set up fee, the cost to this business is just £34.00 a week plus VAT. Business B: employs 3 staff, and pays them monthly, we email the payslips to their company administrator who distributes them to staff. We upload the pensions every payroll run. After the initial £10 set up fee, the cost to this business is just £21.00 a month plus VAT. Business C: employs 12 staff and pays them bi-weekly. We email payslips directly to staff and upload the pension details s every payroll run. After the initial £10 set up fee, the cost to this business is just £46.80 bi-weekly plus VAT. HMRC – We will act as your agent for PAYE to HMRC and handle all your HMRC reporting requirements for RTI and year end. This also reduces the need for staff to request back copies of payslips for mortgage and loan applications or any other reason, giving them added personal privacy and saving office staff the time in meeting any such request. The ability to manage your business payroll with minimum effort, quickly and securely. Imagine what a difference that would make to you and your business. Remove the guesswork and frustrations. Please feel free to call, fill in the form, email. However you contact us; we are always pleased to help.